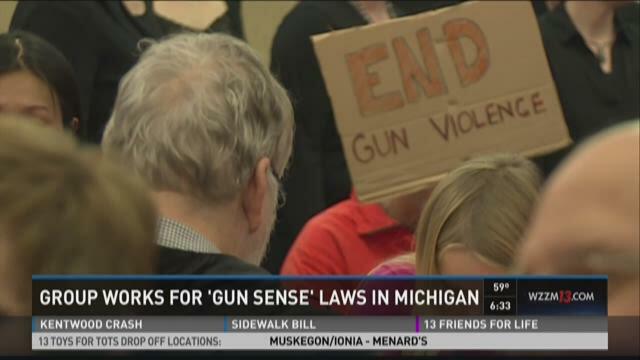 GRAND RAPIDS, Mich. (WZZM) -- Dozens of people wearing orange marched along the streets of downtown Grand Rapids on Sunday to spread a message of peace and resolution, in wake of recent gun attacks. The march commemorates the third anniversary of the Sandy Hook massacre, which took place on Dec. 14, 2012. The organization Moms Demand Action states on its social media page that during the past three years, they have honored victims and survivors of gun violence by calling on Congress and local governments for more realistic and logical gun policies. The local chapter encouraged the crowd to learn more about state Senate Bill 442, which if passed would allow concealed carry in schools, churches and other public places. A candlelight vigil, walk and several guest speakers were included in Sunday's event at the Fountain Street Church. Grand Rapids' murder rate dropped to its lowest level in 50 years in 2014, with six murders in the city compared to 17 murders in 2013.